Eric Burgess and I conceived. in the design of [the] message." 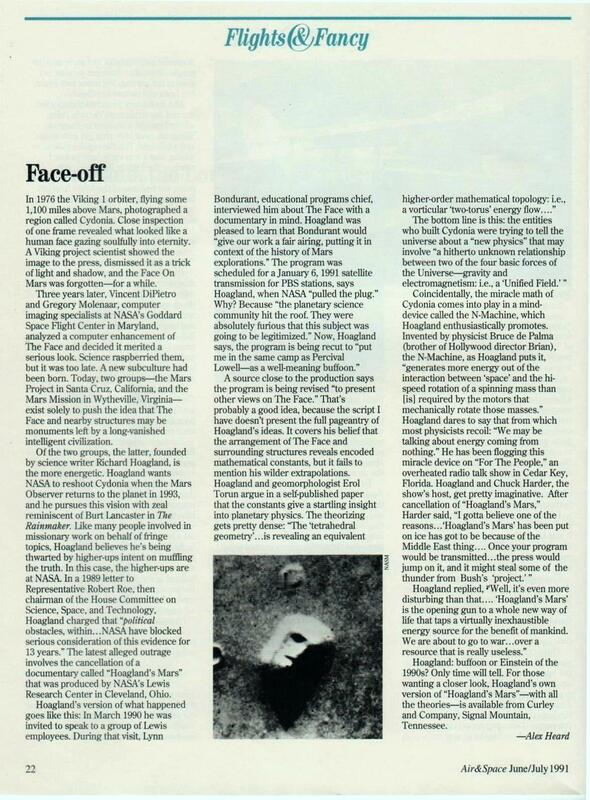 On July 6, 1990, Hoagland accused Omni magazine of "the height of editorial irresponsibility." What prompted him to vent his outrage to the international FTP audience? 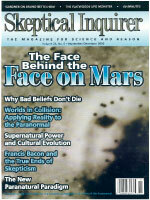 In its July article about a hypothetical "Mars Rover" mission to Cydonia, according to Hoagland the magazine "ascribed to Carl Sagan [my] work on . . . the pyramids and all the other things that are there." But the article referred to the "face" as merely a "mesa . . . named for its resemblance to human features," not as an artificial structure. And there were no references to the rest of Hoagland's "work," although Sagan did refer, metaphorically, to the region's mile-high mountains as "beckoning pyramids." 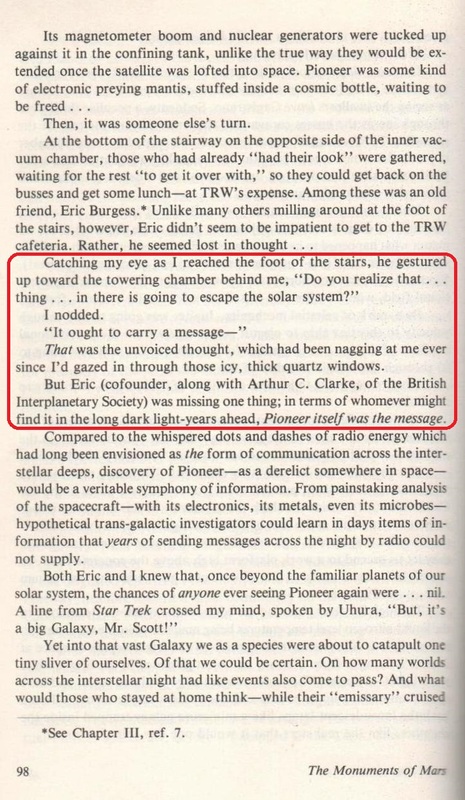 Frank Drake confirmed Sagan's account (September 27 and October 18): "Neither Eric Burgess nor Richard Hoagland contributed any ideas or even suggestions as to what should be on the Pioneer 10, and no suggestions as to any message content. They did point out that Pioneer 10 was going to leave the solar system and it would be nice to put some form of message on it. That was as far as their involvement went. I am sure that Eric Burgess would be glad to confirm this. . . . The idea that there should be an engraved plaque, and the type of information which should be engraved, was developed mutually by Carl and me. . . . I remember very clearly that we started with completely open minds as to what the message should be, and without any prior suggestions as to possible message content." In a note of acknowledgements (see right) at the conclusion of Sagan and Drake's February 25, 1972, Science article entitled "A Message from Earth," Burgess and Hoagland are credited with the "initial suggestion to include some message aboard Pioneer 10." But as Hoagland acknowledges on page 98 of his own book, it was actually Burgess who first said to Hoagland, "It ought to carry a message." (Then, on the next line, Hoagland claims that he had already thought of the idea: "That was the unvoiced thought, which had been nagging at me ever since I'd gazed in through [the craft's] thick quartz windows" (italics in original). The fascinating idea that there might be life on Europa, beneath ice-covered oceans kept liquid by the same Jovian tidal forces that heat Io [Jupiter's volcanic moon], was first proposed by Richard C. Hoagland in the magazine Star & Sky ("The Europa Enigma," January 1980 [accessible from the very bottom of this page]). This quite brilliant concept has been taken seriously by a number of astronomers (notably NASA's Institute of Space Studies, Dr. Robert Jastrow), and may provide one of the best motives for the projected GALILEO Mission.